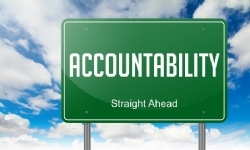 According to Merriam Webster, “accountable” means “subject to giving an account: ANSWERABLE.” Synonyms are listed as: responsible, amenable, answerable, liable. Being accountable means that we do what we say we are going to do, when we say we will do it with the quality of deliverable that was agreed to. If it is that simple, then why is it so difficult for people to be accountable? Is it due to lax standards or incompetence? Is it because when those commitments are made, no one ever follows up? Is it because there are too many things on the plate and there isn’t time? If that's the case, why make the commitment in the first place? In organizational consulting roles, I make commitments to deliver certain products and services, with an identified level of quality, within a certain timeline. Sometimes these are verbal commitments, other times they are contractual agreements. Either way, I am still on the hook to deliver them. If I am not able to deliver what I promised (what I am accountable for), it is incumbent upon me to let my client know and manage his/her expectations. It is an expectation that I will do the work that I am engaged to do as agreed. Excuses and promises that aren't fulfilled don't cut it! I see individuals making commitments at work, but often that work is never fully completed. Sometimes it’s because there are too many things going on, other things take priority, or it wasn’t something that had that much value in the first place. In other cases, agreements are made but no one actually follows-up to ensure that the work was done. This scenario, repeated a number of times, leads to empty promises and reinforcement of poor behavior. It makes it okay not to do the work or take action. This becomes problematic when the work is necessary and required. Want to know how to increase mutual accountability with others? Mutually agree on what the expectations are for the work: quality, timing, work effort, timelines, milestones, reporting process, etc. Document the agreement. This increases the likelihood that identified activities will be completed. This could take the form of an email outlining expectations or a more formal contract. Determine how you will hold each other accountable by establishing a schedule of touch points for status updates. That way you will know if the work is progressing, to what extent, and sets the expectation for completion. If the agreed expectations must be amended due to changes in priority or timelines, let each other know what the changed expectations are. No one likes to complete work only to find out that it is no longer relevant or needed. When the work is completed, debrief and conduct an after action review to determine what was done well and what could be improved. Expectations exchanges help identify and communicate mutual expectations. This is a link to a blog that I wrote on this topic: Expectations Exchanges Help Create Role Clarity. What are your experiences? If you have other tips for increasing accountability, I’d like to hear about them. Leadership Presence - Why you need it and how to get it. Are you causing your own stress? 5 indicators that you are! Lose your job? 10 things you shouldn't do! The Next Wave is Coming - Is your surf board Ready? Need to Read Your Email Faster? The Art of Leadership – Lessons from the world of business, sport and beyond. Do you EXCITE your team? Discrimination In the Workplace - Does it Get Much Worse? Human Capital Crisis: Are you prepared? Y is the Gap so Great? The OGM (formerly, The Oil and Gas Magazine) and the Workplace Speaker Network (WSN) Aligning to Match Oil and Gas Training Needs! Reality TV or Reality on Stage What’s the Rage? What is the emotional wellness status in your organization?